The doctors of Echo Ridge would be happy to answer any questions regarding your dental needs. Please e-mail us at the addresses below and one of the doctors will get back to you as soon as possible. For specific implant questions please e-mail Dr. Ray Schneider III or Dr. Andrew Scott. Our office can be found 2 blocks south of Lambeau Field. 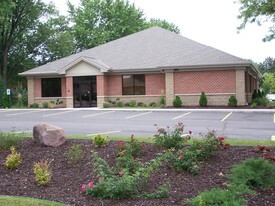 Echo Ridge Dental Clinic is located on the corner of S. Ridge Road and Echo Lane. Echo Ridge Dental - they are ALL AMAZING ! This is the first place I have NOT been scared to go. They have a WONDERFUL bedside manner. They understand people have had bad experiences at Dental offices. They are VERY compassionate. Love Megan- she cleans my teeth. Megan is Very good at her job, professional, so sweet, gentle and always has a smile. Wonderful asset to Echo Ridge. Love Dr Scott and Dr Ray. Very good at what they do also. The front desk- Ashley, Nikki and Sandy- they have a smile for everyone! They are wonderful! They do a very good job at representing Echo Ridge Dental. So thankful I found them! "Having implants done is well worth it...For the long range it is the way to go. There are no root canals to deal with." "If you are considering having dental implants, I would say go for it. It is not painful what so ever. I wish all my teeth felt this good!" "Dr. Schneider gave me a shot and I didn't even feel it. The same when the tooth was extracted." "Relaxing. My dental procedure was relaxing since I'm so anxiety about dentists. Dr. Scott was very nice and his assistant too."